This post is written in partnership with Dryel, I was selected to be a brand ambassador for them, but as always, all my views and opinions are my own. This past month I set a goal for myself, stop letting the chair in my bedroom become piled with clothes in the limbo state of clean enough to wear again, but not clean enough to hang in the closet. I know 'the chair' is a pretty universal problem, and chair prevention requires constant vigilance. If I come home too late in the evening, clothes are destined for the chair. If I'm having outfit indecision and the rejects end up on the chair, then I forget what was actually clean and what was 'chair clean', and the pile continues to grow. When it comes to denim, I'm of the mindset that it shouldn't really be washed, and as such, it becomes my biggest chair offender. When I resolved to putting an end to 'the chair', I knew I had a secret weapon, Dryel. 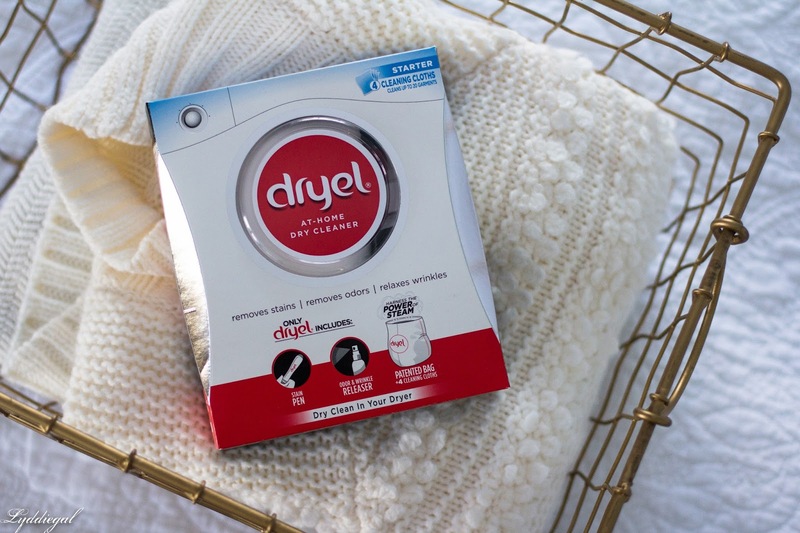 I've been a brand ambassador for them this past year, and have come to appreciate how quickly and easily I can refresh my clothes, from my jeans to my delicate knits, without worrying about any shrinking, stretching, or fading. Coming in 2018 Dryel is releasing a brand new formula and starter kit with a scent that lasts even longer, and they've given the official okay to using it with silk and rayon (though to be honest, I had been before and never had any issue). Now at the end of the day, before I have a chance to let my clothes reach the chair, I pop them in my Dryel bag. After just a 15 minute tumble they are refreshed and deemed ready to be rehung in the closet. If I want to give them a more deep clean, I'll leave them for the full 30 minutes. Dryel makes my life easier. I love knowing that the lace dress I wore to a wedding isn't going to hang around for months before I remember to bring it to the dry cleaner, and I no longer have to feel skeeved out by wearing jeans that have never seen the inside of a washing machine. I remember my days of "the chair" well - when I worked in an office, it was a constant problem. My chairs clothes were very often pieces that genuinely belonged in the laundry basket and I was usually pushing my luck telling myself I could wear them again. Why I wouldn't just put them in the laundry, I still don't know. These days, I'm a lot better about it, but I could probably use a Dryel bag or two in my life even so! I try not to "overwash" clothes that aren't dirty or smelly since it wears them out. This sounds like a great option for those "in between" days! 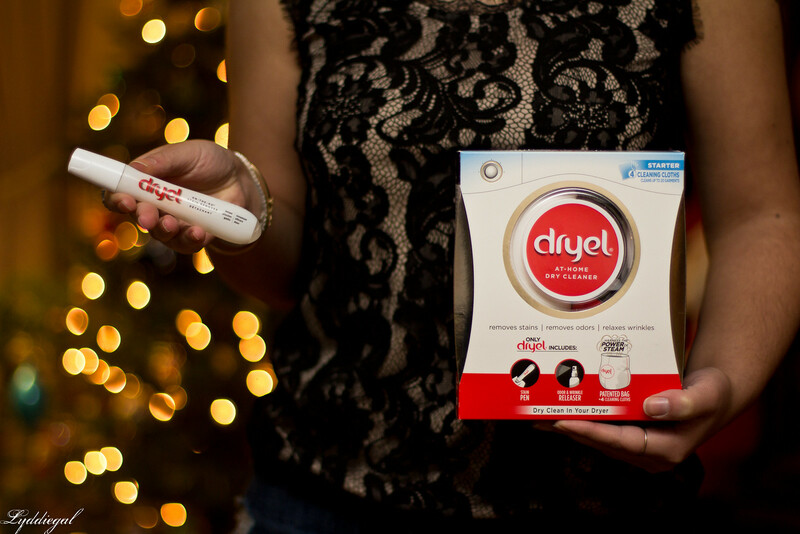 Althought its not available here I actually ordered a box of Dryel and am waiting for the party season to be over so I can use it ! This looks like a really quality and handy product. Thanks for sharing dear. Would give this a try myself soon.